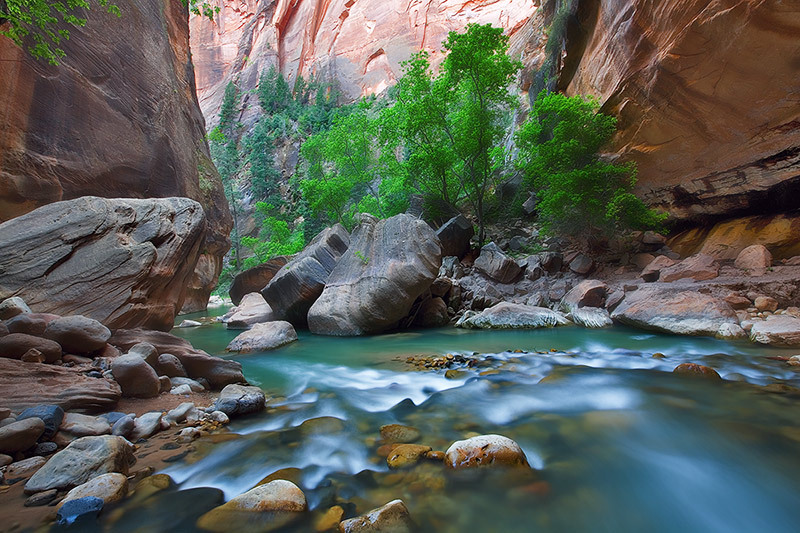 Summer is a powerful season in Zion National Park and its world famous narrows are the prime attraction. Each year massive floods during the winter and spring run off periods rearrange the flow of the landscape. The scenery, including rocks, logs, and pools, is constantly changing. 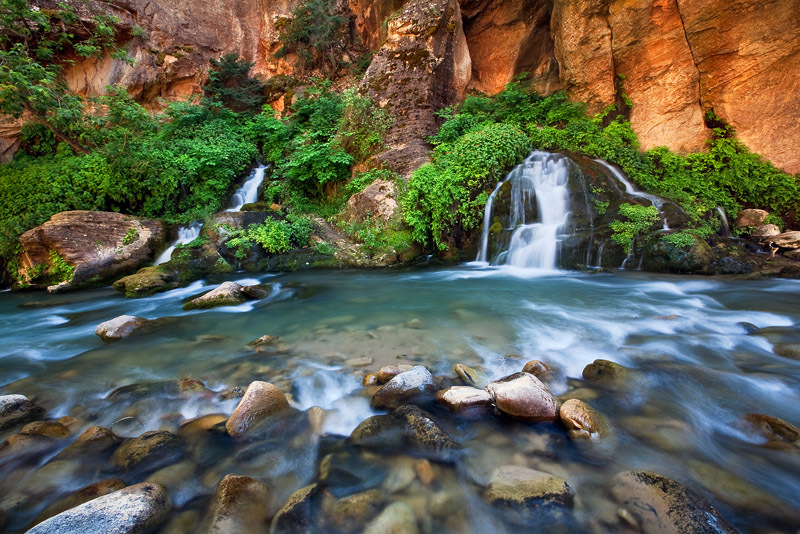 By the end of June, the Virgin River is normally a pristine, aquamarine icon as it weaves and carves its way through canyon walls glowing with color. Brilliant shades of gold, red, orange, yellow, pink, and blue mysteriously decorate its sides. This is landscape photography and adventure at is finest. This is also a time when light is at its best. I’ll have you in the right place at the right time to take home some stunning images of the area. We will visit Wall Street and Orderville Canyon and journey possibly far as Big Springs deep within the heart of the canyon. We’ll examine compositions both up and down river. We'll begin in the morning when the light is soft, the scenery is peaceful, and the crowds are gone. We should have the place relatively to ourselves and the water will be at its clearest. We'll travel deeper into the canyon as the day progresses and I'll have you in position to capture the most dramatic scenery with the best light possible. Our adventure continues in the afternoon as the reflected light continues to shift in tantalizing colors. Every part of the day brings new and exciting photographic opportunities and you'll be there to experience them all! Annual water levels fluctuate, however, trips can be completed anytime between the beginning of June through August in most years. The end of June and the first two weeks of July are optimal times for light. Moderate to Strenuous. 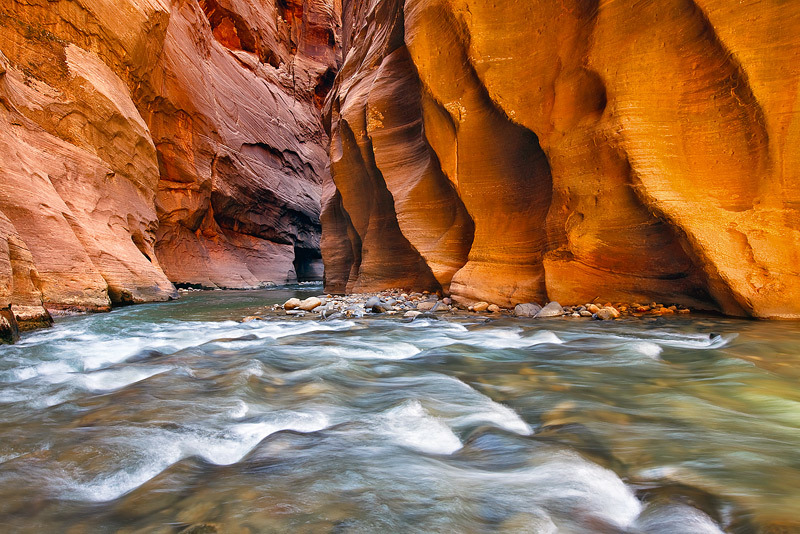 It is a one mile walk on pavement to enter the river and then an additional two to three miles one way to reach the most photogenic areas of the narrows.